Roasted Brussels sprouts with truffle oil. Beechwood spoon, made in France, and Rose’s Perfect Pie Plate, both from HIC. 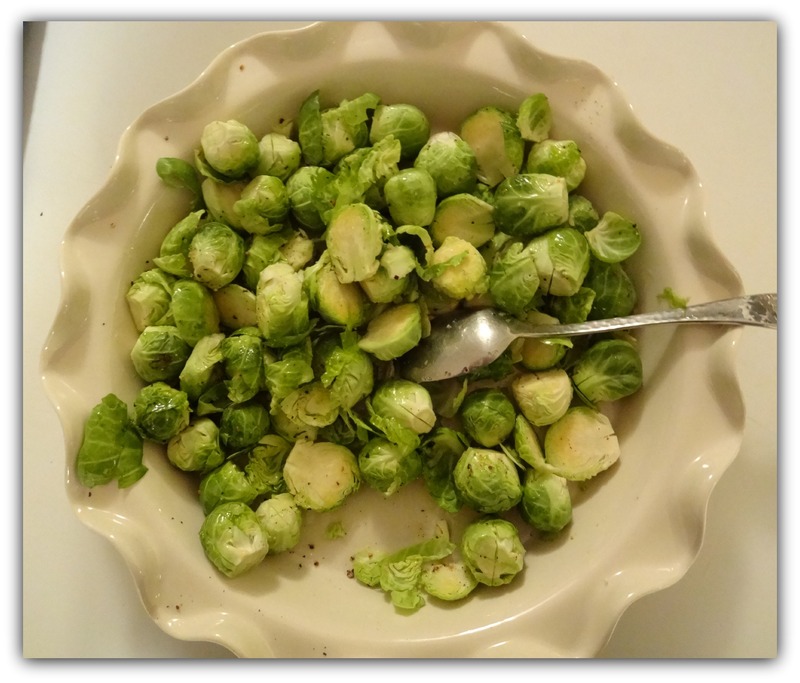 Brussels sprouts – The consistently controversial vegetable. 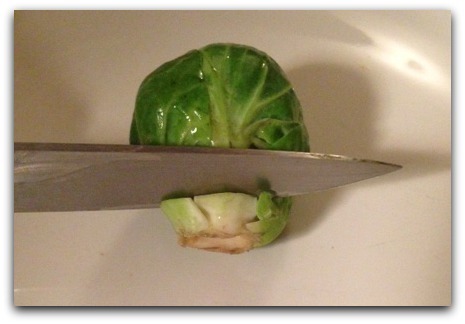 Most people fall into one of two camps here – you either love Brussels sprouts, or detest them. 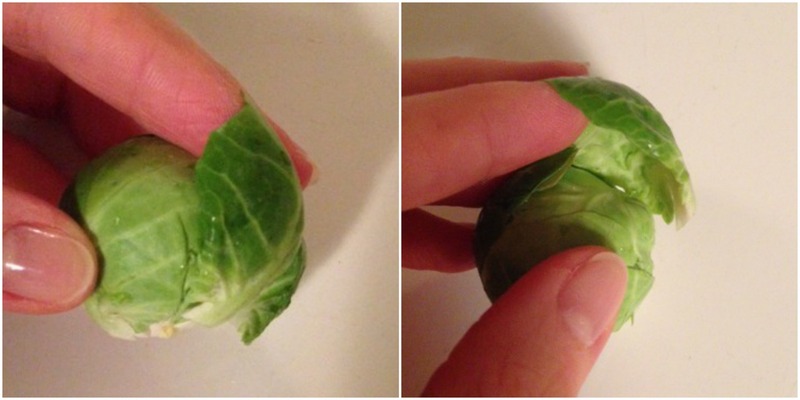 Whether it’s the smell, the texture, or the bad reputation they bear for being displeasing, many people just don’t embrace the Brussels sprout. The technique used in this recipe was passed along from a good friend, who has converted many previously averse, to become embracers of the veggie. What’s different in this recipe? It’s all about changing the texture – We’ll roast both whole and sliced Brussels sprouts together, achieving a mix of softer whole sprouts, and crunchier sliced bits. Love pancetta and cheese? You’re covered. Just scroll down to the “Variations” section at the bottom of this post. Trim the excess stem at the bottom. 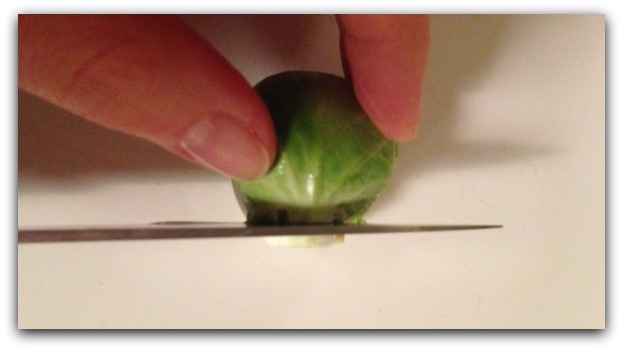 Then, pull the extra rougher leaves off from around the outside of the Brussels sprout. Trim the stem a bit closer, and create a notch in the bottom. The notch aids in more even cooking. For this recipe we’re mixing both whole and sliced Brussels sprouts, because the smaller sliced pieces, as well as the bits that come off the sprout during the slicing process (don’t throw these out- put them in your roasting pan or pie plate) will become crunchier as they cook along side the whole sprouts, sopping up all of the truffle oil and collecting salt, adding savory flavor and variation in texture. 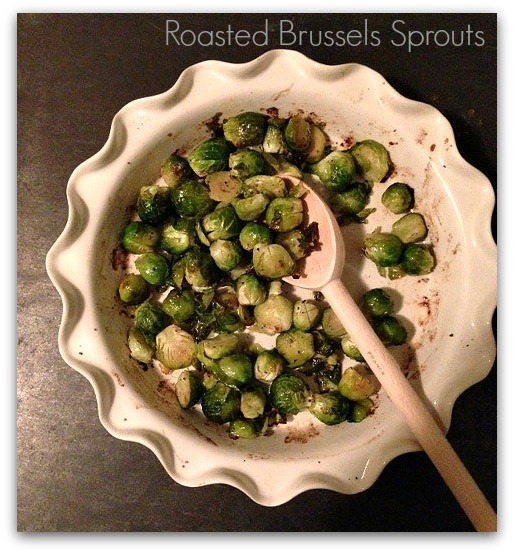 Place both whole and sliced Brussels sprouts in a roasting pan or pie dish. In this recipe, we used Rose’s Perfect Pie Plate. Toss with 2 tbsp. 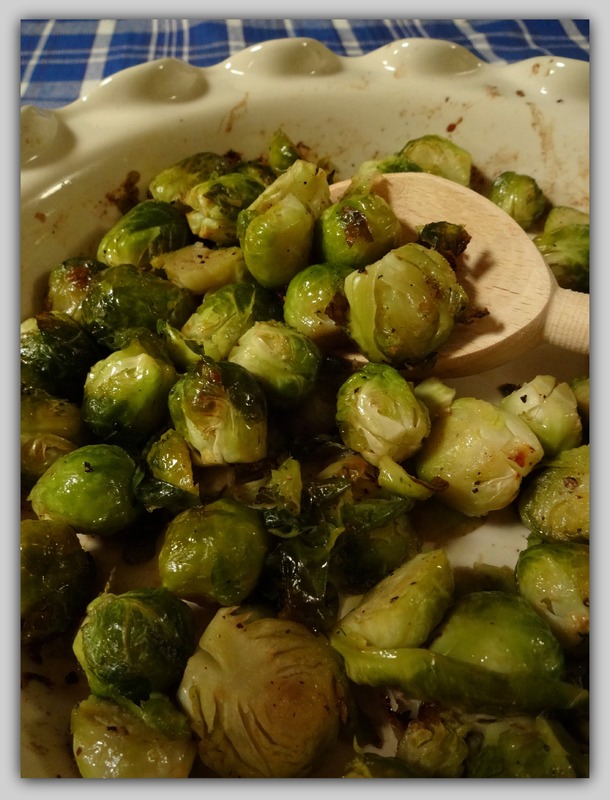 truffle oil until the sprouts are well coated and sprinkle with 1/2 tsp. of Himalayan sea salt (you may prefer to add more to taste, after cooking) and a 1/2 tsp. or a few twists of fresh ground black pepper. 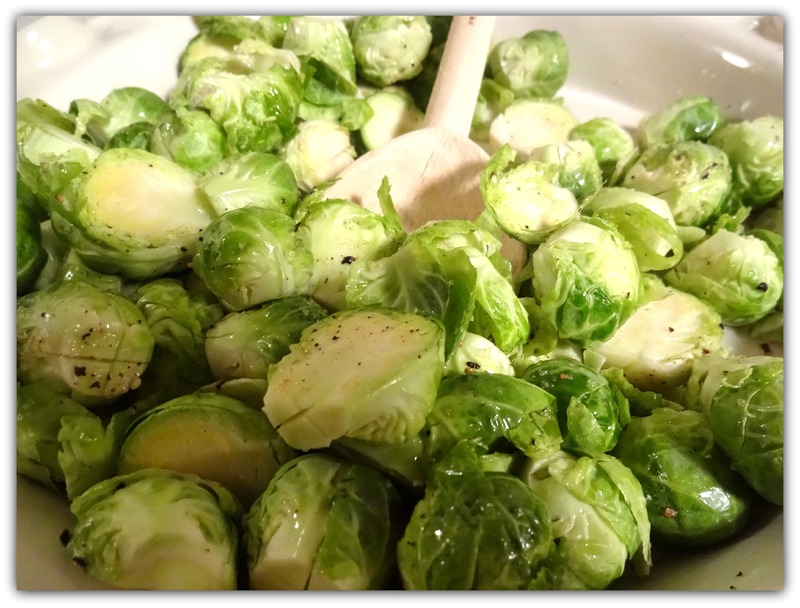 Place the Brussels sprouts on the top rack of a 400-degree oven and cook for 20 minutes, then remove and stir so that the sprouts get coated with the truffle oil and salt that has migrated to the bottom of the pie plate. Put back in the 400 degree oven and cook for another 15 minutes, or until sprouts are browned. 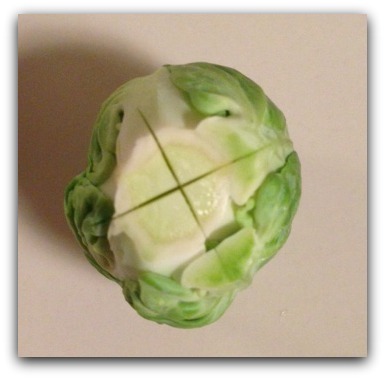 Note, the smaller pieces may brown more and have crunchier edges than the whole Brussels sprouts. The two compliment each other nicely. If you’d like to mix it up, here are a couple variations I’ve tried. Use plain olive oil if you or your guests are not fond of truffles. Toss in pancetta with the Brussels sprouts at the time roasting begins. This imparts a delicious flavor, and fills the kitchen with a wonderful aroma of cooking bacon. Add nuts during the last 5 minutes of cooking. 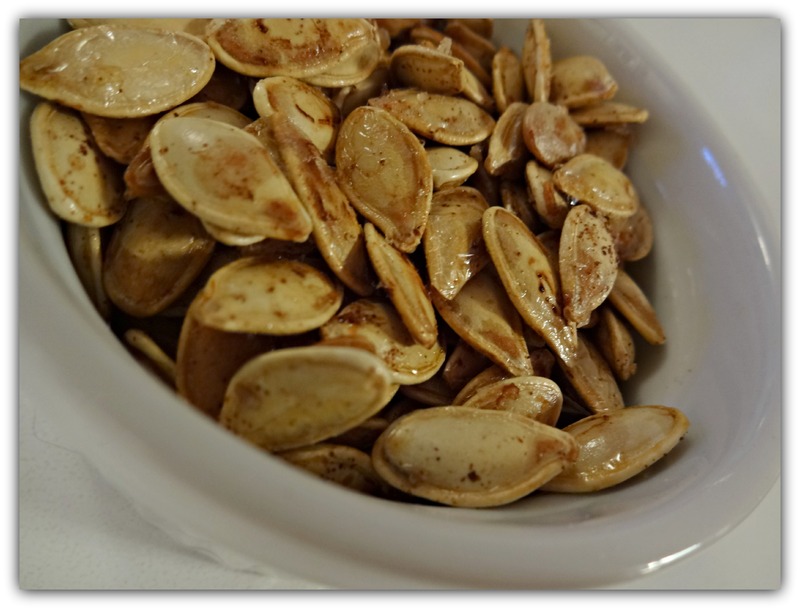 Slivered almonds, pine nuts, or pecans are all delicious, sprinkled on top. Add a 1/2 cup of grated cheese, such as Grana Padano or Romano, 5 minutes before roasting time is up. Stir in, and roast for the remaining time. 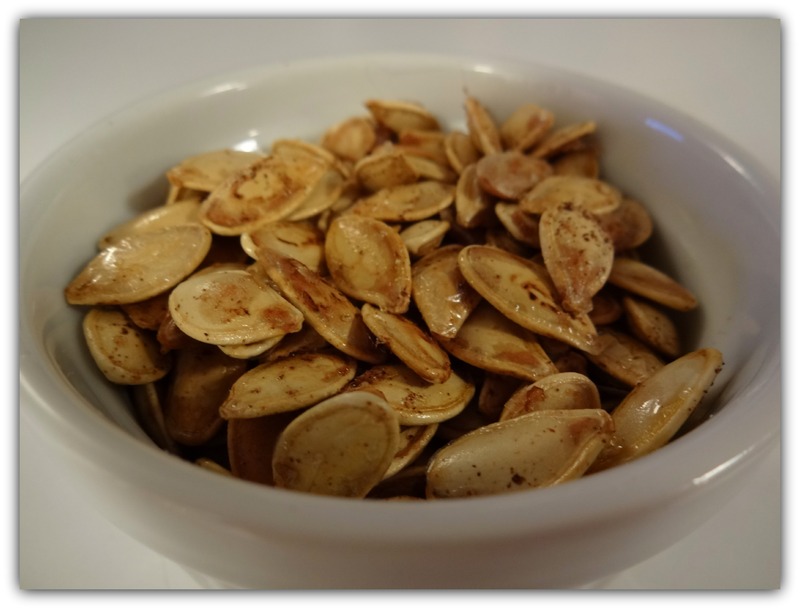 This entry was posted in Cook - Recipes from Friends, Useful Tools and tagged Brussels Sprouts, Rose's Perfect Pie Plate, Thanksgiving Recipes, The World's Greatest Gadgets, Tools Exclusively from HIC Harold Import Co. on October 21, 2013 by HIC, Harold Import Co..